This week on Spellburn we take a look at wizard magic! Described by some as a set of rules that out-Vancian the Vancian Magic System, we’ll take you through the entire system with some live-play examples. 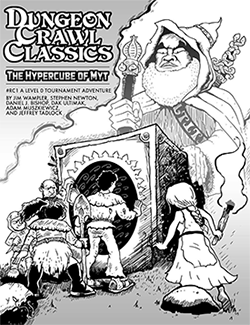 From spellchecks to mercurial magic effects to spell corruption to patrons, we’ll find out what happens to those who dare dabble in the dangerous and wildly unpredictable arcane arts in the Dungeon Crawl Classics RPG. Great minds must think alike, because Joseph Goodman had us pass our extra zero level PCs to anyone who had lost all of theirs at a playtest of DCCrpg / Portal Under the Stars back in June 2011. One dude lost FIVE characters (all of his plus two that were donated from fellow players). Absolutely fantastic episode! Love the thorough detailing of the magic system and in-depth rules discussions. In my home game, I made use of Joseph Goodman’s Mysterious Tower adventure for 3rd edition. I changed the owlbears in that adventure to hawk-wolves, and it worked out very well. I described the otyugh as a gelid cone-shaped mass with three stubby legs and three stubby tentacles. It is pretty cool how changing the descriptions, even where you do not change the stats (much) really changes the way player view the material. I think that is the key in using older adventures with DCC RPG. Give them a twist, even if it is simply adding flavor to the monsters. I love that adventure, Daniel. I would add though I wouldn’t necessarily remove every last classic monster. I loves me some owlbears. I left some of the classic monsters. The giant beetles, the gelatinous cube, pretty much everything within the tower itself. Of course, the party released the acid trap, so they may never see the tower interior……. I adore the podcast it’s amazing and it’s nice to hear people who love this system as much as I do. I’ve been trying to convert all the grognards over on the unseenservant.us boards and sometimes they look at me like i’ve been corrupted and gained a second head! My only complaint honestly I think comes from the funnel and this may be because i’ve only had a chance to run in a Play by Post format. It feels like the characters are very disconnected from the players, it’s not that they are trying to kill them but there’s little connection with them. This may be because the characters are made so easily and are built over time and adventure. I have found that over time as characters have died in Sailors on the Starless Sea the better the roleplay has become and the more in-tune the players seem with their characters. The Magic System is probably the #1 reason this game pulled me in. Finally casters have to roll and have a consequence for their actions instead of dominating a group. I have to say for spellburn drawbacks I loved reading RavenCrowKing’s DCC game on the US forums in which a mage burnt himself to the stone age for a Patron Bond and as a result he had a giant bleeding blister and kept his reduced stats until he could get a gem for his new found deity. Absolutely loved that consequence! Lastly i’m curious how you guys feel about mixing deities and patrons together. I think it makes more sense to just make them one big pot a cleric could worship a demon who gave her powers just as a wizard could form an agreement to gain power. Their interactions are different but both in my eyes could form that bond. I wonder if anyone else has decided to do that? Alright i’m done making this entirely too long post again thumbs up for the podcast guys keep it going! I’m loving the podcast! Keep up the good work, people. Whereabouts do you live, AQuebman? Maybe we can get some DCC action going in your area! Cincinnati, Ohio so i’m fully aware of all the game shops they talk about in the podcast which is cool. I have to work around time constraints between work and the wife but other than that i’m usually up for some gaming! I do have one gaming group but they are steadfast into Pathfinder and there’s no shaking them from that unfortunately. Ah, a fellow resident of Lake Geneva South… welcome! Indeed! Todd over at Gateway Games is a great guy I can’t promote his store enough though he is a bit of a trek for me to reach. I live right next to Yottaquest though and they are pretty great too. We have a nice following of gaming stores in the area which is very nice. I grew up in Wisconsin, and I still try to head back there occasionally (annually) to visit family. I would be happy to swing in your direction on a trip one of these times…. Well i’m not actually in Wisconsin i’m in Ohio Judge Jeffry just likes to refer to us as Lake Geneva South hehe. Though if you ever make it down to Cincinnati i’m sure we could have a nice gathering at one of the local game shops and get our DCC on! Another great podcast gentlemen. I really enjoyed the focus on magic & spellburn. It would be interesting to do a brief description for “new players” of the unique characteristics of classes “Let’s tak about Halflings and Luck… let’s talk about Elves and Magic…” specifically when there are significant differences to D&D or OSR. Nice work. Again, a great Episode. Please do a Episode where you talk about Mighty Deeds and the possibilities. I have added as a final challenge to the pcs, The “Abomination” a disgusting experiment birthed by evil mages, who turned on his creators and escaped in to the Forest. He has the head, torso and arms of a man, a chest piece shell providing a high AC bonus and the strong bacl legs and wings of a Roadrunner. Keep up the good work, and let all your rolls be 20’s. The Random Esoteric Creature Generator is a *great* resource for DCC games (and other games you want something different than ordinary)! A bit late getting around to Episode 5 — but another one well worth the listen. I’m giving this episode a second listen. I love the DCC magic system! When I run Labyrinth Lord I incorporate a spell roll into the mechanics. Nothing as elaborate as the spell check in DCC. I just have the PC roll a d20 and he has a 50% chance to retain the spell to cast it again, modified down as the spell’s level goes up. This has made 1st level magic-users in the classic rules far more exciting to play, IMHO.